Will Turkey's New Diplomatic Push Reduce Its American MB Support? Turkey is mending fences with Egypt and cutting back its support for the Muslim Brotherhood in response to the deadly terror attacks that have struck the country over the past year, The London Times reports. This outreach to Cairo coincides with a rapprochement between Israel and Turkey after a six-year estrangement and Ankara's attempts to restore ties with Moscow, officially turning Ankara's foreign policy from recent years on its head. Turkey, under the leadership of the Islamist Justice and Development Party (AKP), had become notorious for its support of the international Muslim Brotherhood headquartered in Egypt and Hamas, the Brotherhood's terrorist offshoot in the Palestinian territories. Key Hamas leaders have found refuge and an operating base in Turkey. After the Egyptian army ousted President Mohamed Morsi and the Muslim Brotherhood's political party, Turkey denounced it as "state terrorism" and let Brotherhood officials and media outlets set up shop there. An investigation by the Investigative Project on Terrorism finds that Turkey's support for the international Brotherhood and Hamas has expanded to include U.S.-based Islamist and Brotherhood groups, including the US Council of Muslim Organizations (USCMO), Council on American Muslim Relations (CAIR), American Muslims for Palestine (AMP), and Islamic Circle of North America (ICNA). 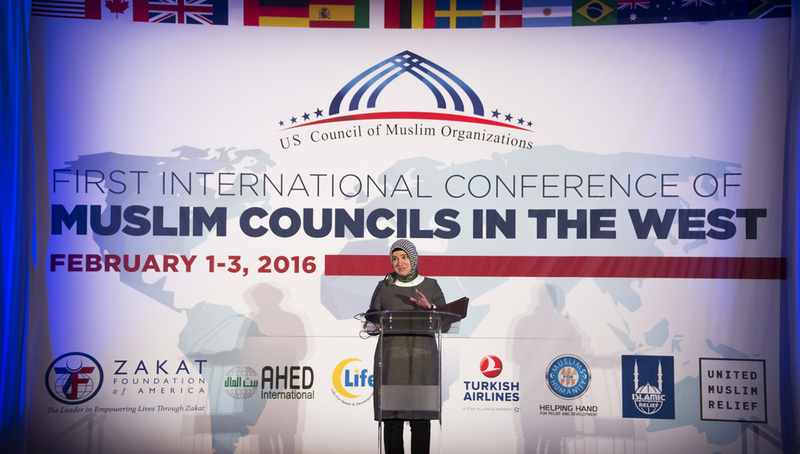 USCMO is an umbrella group of leading Islamist groups in the U.S. that have origins in the Muslim Brotherhood or a former Hamas-support network in the United States called the Palestine Committee. According to internal records, the Palestine Committee sought to support Hamas politically and financially in the U.S. If reports about Turkey scaling back its support for the Egyptian Muslim Brotherhood prove true, one could rightfully assume that the next logical step for the AKP, led by Turkish President Recep Tayyip Erdogan, would be to extend its foreign policy about-face to include the Brotherhood network in the U.S. Political leaders affiliated with the AKP and members of an Islamist Turkish business group have established deep relationships with the Brotherhood network in America, including with think tanks and academic centers affiliated with CAIR, USCMO, and other Islamist groups. Last month, CAIR received a delegation of representatives from MUSIAD (the Independent Industrialists and Businessmen's Association), an Islamist business group that is close to the AKP. The delegation, led by MUSIAD's president Nail Olpak, "invited American Muslims to participate in its upcoming International Fair and International Business Forum Congress, November 9-13, 2016 in Istanbul, Turkey," a press release issued by the business group's USA branch said. MUSIAD "was founded by a group of young Islamic businessmen in 1990 as a counterpart to the powerful secular-oriented Turkish Industrialists' and Businessmen's Association [TUSIAD]." In the late 1990s, the Turkish Army blacklisted several Islamic businesses that included prominent MUSIAD leaders for bankrolling radical Islamist activities. MUSIAD's chairman at the time, Erol Yarar, was charged with "inciting hatred" and prosecutors called for closing MUSIAD. In the 2014 book, Islam and Democracy: Perspectives on the Arab Spring, Aylin Unver Noi, a non-resident fellow at Johns Hopkins' Center for Transatlantic Relations, alleged the Islamist business group also provided financial assistance to the Muslim Brotherhood: "Since the AKP came to power in 2002, Turks have cultivated the pan-Islamic Muslim Brotherhood groups, including the Egyptian Muslim Brotherhood. Turkish businessmen, under 'MUSIAD' (the Independent Industrialists and Businessmen's Association), have provided financial support to the Muslim Brotherhood." It is interesting to note that the secular-leaning Turkish business group, TUSIAD, also hosts a branch in Washington, D.C., but unlike its Islamist counterpart, TUSIAD lists mainstream organizations such as the Brookings Institution and German Marshall Fund as its partners. MUSIAD USA has met with CAIR leaders and invited them to its events a number of times in the past. In December 2014, leaders of MUSIAD USA invited CAIR to participate in their international business forum in Istanbul in November the following year during a visit to CAIR's Washington headquarters. CAIR leader Nihad Awad also spoke at the 2013 International Young Businessmen Congress in Istanbul organized by "Young MUSIAD," the youth wing of the business group. "You must control the interview," CAIR's Awad tells a Brotherhood-affiliated youth forum. In April 2014, MUSIAD USA hosted a gala dinner at the Ronald Reagan Trade Center that included Awad as one of its "honorable guests." Awad also presented a workshop at the Brotherhood-affiliated Al Sharq Youth Forum titled, "Creating a lobby—Learnings [sic] from CAIR." According to a Facebook post, Awad's message was, "You must control the interview." CAIR presented its 2015 Humanitarian Award to Turkey "for its humanitarian efforts for Syrian and Iraqi refugees." Thanking CAIR for the award, Serdar Kilic, Turkish Ambassador to the U.S., said "the brotherly feelings of CAIR for Turkey and its people made the award 'much more valuable.'" CAIR's "humanitarian award" went to a government that in recent years has clamped down on press freedoms and engaged in human rights abuses against ethnic minorities, including its large Kurdish population. 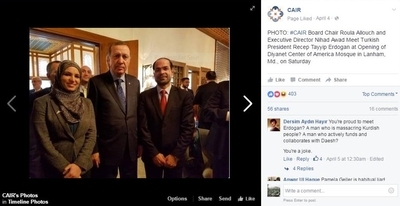 CAIR Executive Director Nihad Awad poses with Turkey's President Recep Tayyip Erdogan in April. In a November interview with Turk Press, Awad hailed the AKP's recent electoral victory, which further consolidated Erdogan's power, as "tantamount to a global Islamic wedding which was a delight for all, especially those who believe in Islam, and that Islam is not only a status but a leader upon the international and humanitarian scene." According to a report in Forum USA, a Turkish-American newspaper, Awad along with senior officials from ICNA, and USCMO attended an Iftar program with Erdogan during his visit to the United States in early June. Erdogan allies in MUSIAD USA work directly with the USCMO. MUSIAD USA spokesman Ahmed Cetin Guzel is listed as a USCMO board member, but he is described only as principle at TACS (Turkish American Cultural Society). The organization has been at the forefront of efforts by pro-Turkey groups to lobby lawmakers against referring to the death and expulsion of 1.5 million Armenians in 1915 as "genocide." USCMO adopted the TACS position. In April 2015, the Islamist umbrella group issued a statement advising caution against "characterizing the events of 1915 as genocide without proper investigation of these events by independent historians." "As Americans, we are concerned about alienating a key ally, Turkey, through one-sided declarations that political and religious leaders have made on this subject," the statement added. The Erdogan-led AKP government's web of Islamist support in the U.S. includes sponsorship for conferences and other events by Turkey's state-backed news agency and national airline. Turkish Airlines, which has nearly 50 percent of its shares owned by the Turkish government, sponsored USCMO's First International Conference of Muslim Councils in the West from Feb. 1-3 in Arlington, Va. Turkish Airlines has also been as one of the "top sponsors" of the annual conventions co-hosted by the Muslim American Society (MAS) and the Islamic Circle of North America (ICNA). Anadolu Agency set up a booth at the May ICNA-MAS convention in Baltimore that was visited by Turkish Ambassador Kilic. "Anadolu Agency functions as a very important tool to deliver the news about ongoing developments in Turkey and Turkey's political approach to the region, in a correct way, to the correct recipients," Kilic reportedly said. MAS-ICNA conventions routinely feature radical speakers who advocate jihad and call for the elimination of Israel. 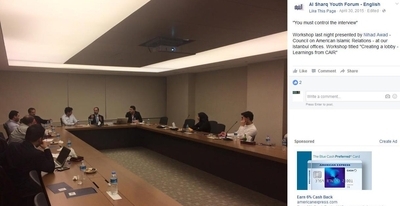 Meanwhile, a top Erdogan spokesman is connected to both a Saudi-funded American academic center and a Virginia-based think tank with suspected Muslim Brotherhood ties. Ibrahim Kalin is listed as a fellow at Georgetown University's Prince Alwaleed bin Talal Center for Muslim-Christian Understanding . The center received a $20 million gift from Saudi Prince Alwaleed bin Talal in 2005. Its founding director John Esposito has a history of support for Islamists. Immediately after the Arab Spring revolutions across the Middle East, Kalin predicted a more prominent role for Islamist movements in the region and called for greater engagement between them and the West: "...the Muslim Brotherhood in Egypt, the Nahda Movement in Tunisia, and Hamas in Palestine will all play important and legitimate roles in the political future of their respective countries. This means that Americans and Europeans will need to engage these groups publicly and directly, as Turkey has done, not secretly or indirectly, as they have in the past. After all, they are now part of the emerging political order in the Arab world." In other writing, Kalin praised the Muslim Brotherhood luminary who helped create the International Institute of Islamic Thought (IIIT) based in Herndon, Va.
Ismail Raji al-Faruqi "advocated a radical Islamization of new knowledge. He recognized that the crisis of the modern world was the crisis of knowledge," Kalin is quoted saying in a paper on al-Faruqi's work, the "Islamization of Knowledge," which was published by IIIT. "And this crisis, al-Faruqi thought, could only be cured via a new synthesis of all knowledge in an Islamic epistemological framework. The 'Islamization of Knowledge' project sought to arouse Muslims to become active participants in intellectual life and contribute to it from an Islamic perspective." In another paper on the role of modern science in Islam, Kalin praises the "commendable literature produced by Ismail Faruqi and his protégé International Institute of Islamic Thought [IIIT]." Kalin also puts Islam at odds with the Western-style secularism. In a paper titled, "Roots of Misconception: Euro-American Perceptions of Islam Before and After September 11," he writes: "It is obvious that secularism, as developed during the European Enlightenment, with its non-religious and profane view of the world and society, is not compatible with Islam or any religious tradition for that matter." IIIT, a private think tank in Virginia, was listed among "members and leaders of the IKHWAN [Muslim Brotherhood]" in the United States in records obtained by the IPT from a closed FBI investigation through a Freedom of Information Act request. IIIT press releases show Kalin has visited its offices. The pro-Muslim Brotherhood and Hamas stance by Erdogan's AKP government in recent years has created major foreign policy challenges for Turkey by irking its neighbors and leaving it with few friends in the Middle East. If Ankara is serious about ending its regional isolation and reverting to a "zero problems with neighbor's policy," it needs to stop its patronage of the Muslim Brotherhood and its Palestinian protégé, Hamas. Any recalibration in Turkey's policy to mend fences with neighbors should not just roll back support for the Muslim Brotherhood across the Middle East but also for the Islamist movement's front groups in the U.S. However, given Erdogan's growing authoritarianism and desire to be perceived as a modern-day sultan and leader of the Muslim ummah, support for Islamist movements likely will continue to be considered a religious duty and not a political choice.